She can change your life. For me, that teacher’s name is Nancy Erley. The first time I met her was brief, just a short exchange after hearing her insightful presentation on crew communication at a sailing expo. But I never forgot her. The next time I met her was years later. I was grieving the loss of the man I’d sailed with for eight years, and though I wanted very much to continue cruising on Kagán, I wondered if I could even maneuver her into my narrow slip, much less sail her on my own. Then Nancy spent a week with me on Kagán, and she changed my life – on my boat, certainly, and in ways I couldn’t have imagined before I lived into taking Kagán’s helm. 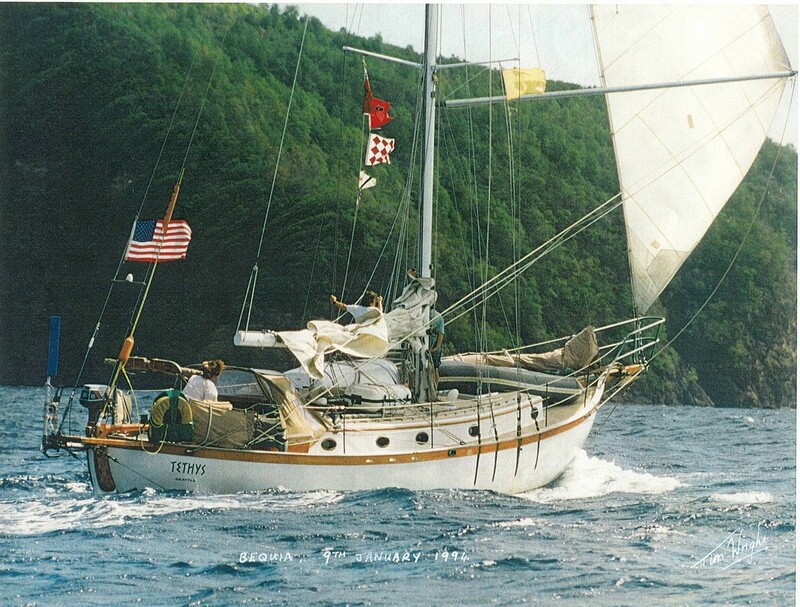 During that week, she watched me, asked questions about the role I had played as first mate, and gently suggested that if I’d done things like set sails in gusty winds and set anchors in deep, remote anchorages with Jerry, then I could do those things, with sensible adjustments for single handing, on my own. She knew a little something about all this, a passionate sailor, Nancy has completed two circumnavigations on her boat, Tethys. During those trips around the globe, she taught women how to cross oceans in a small boat, as they did it together. 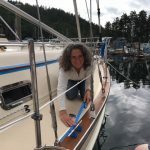 Her gift for imparting the skills and the wonder of both the physics and the art of sailing, tailored to fit each of her “learners,” has changed lives, made dreams come true. This is not hyperbole, it’s what Nancy does. First, we would talk through the whats and hows, and then she would assure me she’d be right there if I needed her, but I should try these things as if I was single handing. 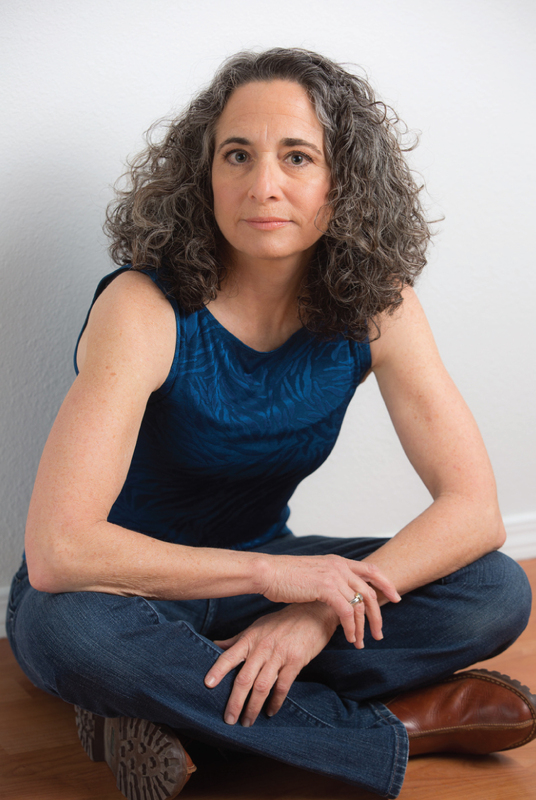 From seemingly casual conversations, she intuited what I felt I could already do, and what might stop me. She nudged me toward those lessons. Her confidence and the reassurance of her presence gave me the courage to try. And to keep trying after our week together, even though I was still afraid (especially of maneuvering under power in tight spaces with my full keel boat that doesn’t like to start turning and once she turns doesn’t like to stop). Nancy encouraged me to let go of the fear, which for sailing solo I could. It took longer, years in fact, to let go of the fear of going into new marinas, having to maneuver in unknown tight spaces. Sometimes I succeeded (nailing a tough landing feels great) and sometimes I failed (seems your ugliest landings always happen with an audience on the dock), but I never stopped trying. And that’s the key – if you keep docking, you learn how to dock in different places in varying conditions. Then one day, you realize that now you have a great deal of respect for every docking (really, there’s a lot going on when you dock a boat, but that’s another story), but not so much trepidation. That “you become what you practice” thing – it worked again. 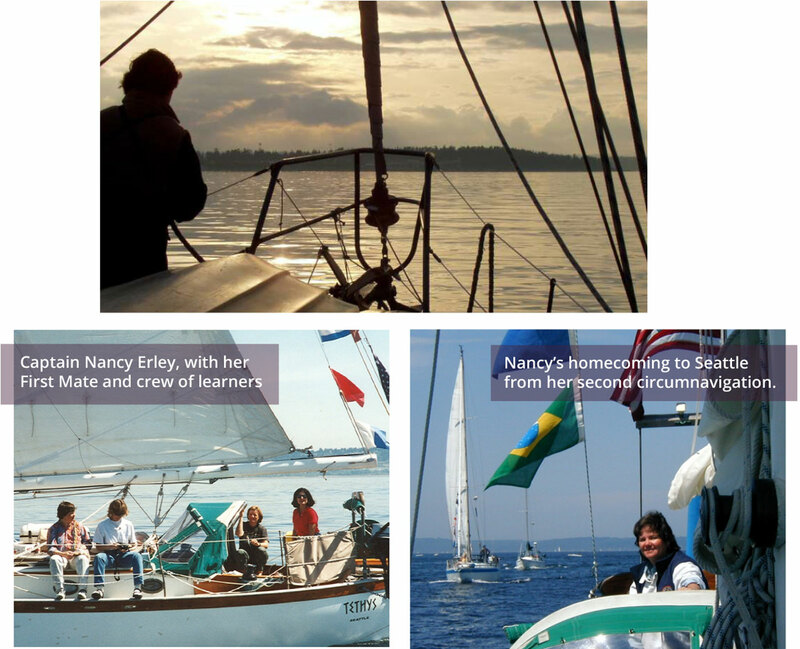 The lessons continue, occasionally in person (thanks for those great days on Port Townsend Bay earlier this summer, Nancy! ), and more frequently on my own, not only using the skills she’s taught me, but also trying to emulate the examples she’s set for me to be the skipper I aspire to be. That’s what a gifted teacher can do. Tell me about your Nancy Erley. How has he or she changed your life? Your blog is taking some very interesting turns. Fantastic discourse! Hope to get to sail with you someday!!! Deb … This is a most interesting piece that caused me to reflect on the many people and places and things (Yes – not just people!) that have me taught me during my life’s journey. Certainly not all lessons have been kind and gentle, although most have, but all have helped me grow and expand – hopefully in good and considerate ways – regarding how I think and act and live in association with people and the natural world. Even your words teach me much that is worthwhile, in truth. I continue to reflect on the many wonderful things and lessons that have guided and changed my life as a result of you last writings! On a point I consider directly related, the topics you have outlined for your Jahn’s lecture tour will will doubtless help “teach” all listeners who attend. Go Deb! What is your Jahn’s lecture tour going to include? Can non-geologist attend events?